As a whole, Car Wrap City, believes firmly in giving back and we have a few ways we enjoy doing so. Really, that’s the key: finding a charity, cause or organization that speaks to you and that you enjoy being a part of, and running with it. Maybe you, like so many of us, are short on time and/or resources, but that doesn’t mean you have nothing to offer! To see some of the non-profits we’ve worked with or organizations we enjoy giving to, check out our "giving back" tab. 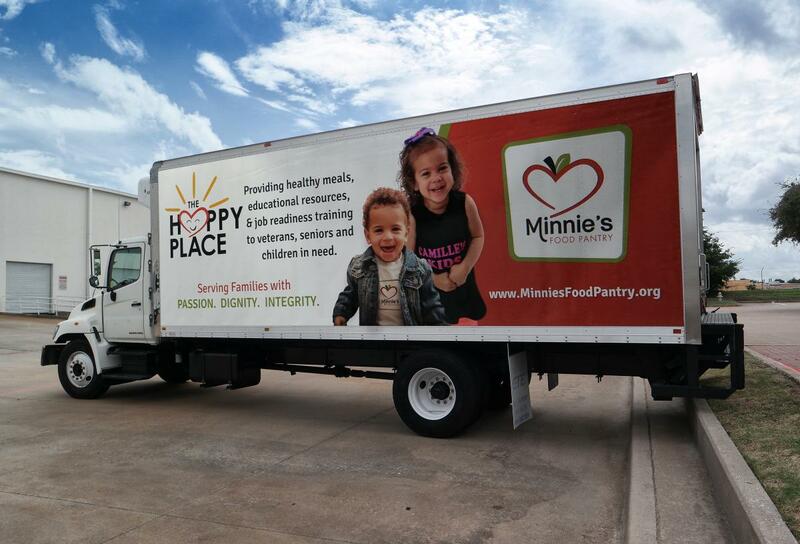 It's our honor to help Minnie's Food Pantry spread the word about their wonderful organization. "Minnie’s Food Pantry receives no government support and is 100% community funded. Long term underemployment, unemployment and the high cost of food, gas, utilities and rent are forcing more and more people to seek emergency food. ... The solution is simple. All it takes is great volunteers with a desire to impact the community every time they serve at Minnie’s Food Pantry. ... Minnie’s Food Pantry has brought light to the issue of food insecurity on both a local and national level. We have been featured on: The Food Network’s documentary, Hunger Hits Home, The Ellen DeGeneres Show, Good Morning America, Entertainment Tonight, The Talk and The Steve Harvey Show, amongst others. Minnie’s Food Pantry was also featured on The American Bible Challenge where #TeamMinnies won $25,000 to continue the fight against hunger." - Have your kids help stuff gallon size ziplock bags with protein-rich snacks and toiletries to hand out to the homeless. - Go read to the elderly at a local nursing home. - Help your children to remove anything they’ve outgrown and take it to a Woman’s shelter. - Bag leaves for someone in your neighborhood who might be in poor health. You can also find opportunities here, by zip code, organization or cause and be matched immediately! Now that we’ve armed you with plenty of ideas…Go join the group of over 11,000 people who pledged to give today! Go, and give every day that you’re able! You can make a difference, we all can! Be sure to tag #NTxGivingDay and us in any photos, we want to see the goodwill being spread throughout the metroplex!